Prime Minister Narendra Modi, who is looking to come back to power, is facing a combined opposition from all anti-Bharatiya Janata Party (BJP) parties who have joined hands with the sole objective of defeating the saffron party. NEW DELHI: The Election Commission (EC) on Sunday announced that the Lok Sabha election will be held in seven phases from April 11 and the results will be declared on May 23. The poll dates are April 11, 18, 23, 29, May 6, 12, 19. In the first phase, 91 seats across 20 states and UTs will go to polls; Second phase: 97 in 13 States and UTs; Third phase: 115 in 14 States and UTs; Fourth phase - 71 in 9 States and UTs; Fifth phase: 51 in 7 States and UTs; Sixth phase 59 in 7 States and UTs; Seventh phase: 59 in 8 States and UTs. 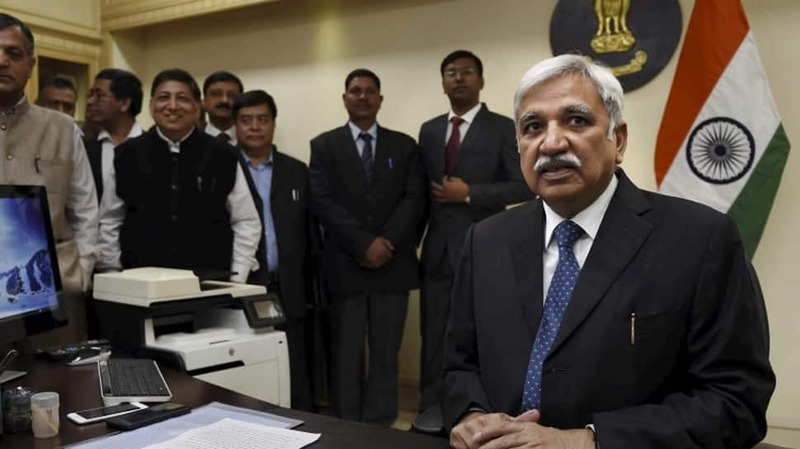 Chief Election Commissioner Sunil Arora while addressing the press conference on Sunday said that the model code of conduct will come into force with immediate effect. The term of the present Lok Sabha ends on June 3. Along with the Lok Sabha election, assembly polls will also be held in four states, namely Andhra Pradesh, Odisha, Arunachal Pradesh, Sikkim. The polls will be held simultaneously with the parliamentary elections. The term of the Sikkim assembly ends on 27 May 2019 while the terms of Andhra Pradesh, Odisha and Arunachal Pradesh assemblies end on June 18, June 11 and June 1 respectively. In Jammu and Kashmir, only Lok Sabha election will be held as of now in view of the security situation in the state following skirmishes with Pakistan. The CEC said that poll observers are closely monitoring the situation there. The six-year term in J&K was scheduled to end on 16 March 2021, but the Assembly was dissolved after the ruling coalition between the People's Democratic Party (PDP) and the BJP fell apart. The state is currently under President's Rule, hence the EC is bound to hold fresh polls there as well within a six-month period, which will end in May. The Congress has welcomed the declaration of the Lok Sabha election schedule and said the victory will be of the truth. The Congress put out a two-minute video entitled 'aarambh hai prachand' (the beginning of something massive), showing the Congress President Rahul Gandhi meeting the people across the country. States going to polls in seven phases: Bihar, Uttar Pradesh, West Bengal. BJP President Amit Shah has welcomed the declaration of elections for the 17th Lok Sabha and urged the people people of India to turnout in record numbers and enhance the vibrancy of India’s electoral process. The CEC remarked that the EC has tried to cover left-wing affected areas of various states at one go. CEC Sunil Arora said that the EC has also directed political parties/candidates to desist from using environmentally hazardous publicity material&promote usage of eco friendly substances for preparation of election campaign material, this is a kind of appeal to everybody," ANI reported. Soon after the election dates were announced, Prime Minister Narendra Modi tweeted urging people to take part in the poll process. "The festival of democracy, Elections are here. I urge my fellow Indians to enrich the 2019 Lok Sabha elections with their active participation. I hope this election witnesses a historic turnout. I particularly call upon first time voters to vote in record numbers," he said. In a series of tweets, he said: "Wishing all political parties and candidates the very best for the 2019 Lok Sabha elections. We may belong to different parties but our aim must be the same- the development of India and empowerment of every Indian!" Best wishes to the Election Commission, all those officials and security personnel who will be on the field, across the length and breadth of India assuring smooth elections. India is very proud of the EC for assiduously organising elections for several years. Chief Election Commissioner: Elections to the state Assemblies in Andhra Pradesh, Odisha, Arunachal Pradesh and Sikkim will be held simultaneously with the Lok Sabha poll. They will follow the same poll schedule as the Parliamentary election. Chief Election Commissioner: In view of the security situation in Jammu and Kashmir, it has been decided that only parliamentary elections will be held as of now there. Poll observers are closely monitoring the situation there. Chief Election Commissioner: Total electorate in this Lok Sabha elections will be 900 million, of which 15 million voters are in the 18-19 age group. There will be approximately 10 lakh polling stations in this Lok Sabha Elections as compared to 9 lakh polling stations in 2014. Chief Election Commissioner: CAPF forces will be deployed in large numbers specially in sensitive areas. There will also be targetted deployment of central forces in extremely sensitive areas. Chief Election Commissioner: The Model Code of conduct comes into effect immediately from today and all political parties are expected to follow the poll code. Elaborate arrangements have been made for the elections. Usage of loudspeakers will not be allowed in after 10 pm. Chief Election Commissioner: All vehicles carrying the EVMs and VVPATs will be installed with GPS trackers and mobile-based tracking system. End-to-end movement of all reserve EVMs and VVPATs shall be carefully monitored at all times, for which vehicles of sector officers, with reserve EVMs and VVPATs, shall be fitted with GPS tracking system. Chief Election Commissioner: On the EVMs, a NOTA button will be present to ensure that voters get to opt for that option if they want. VVPATs will be used at all polling stations in this election. There will also be reserve units in case of malfunctions. Chief Election Commissioner: Examination schedules of various boards, religious festivals, harvest season in certain areas and weather is also taken into consideration while ascertaining the dates. Chief Election Commissioner: We visited several states and UTs to review the poll preparedness. We have a standard procedure to access the preparedness as has been followed in the past. Chief Election Commissoner Sunil Arora addresses the press conference to announce the schedule of the Lok Sabha elections. He in that to ascertain and review the poll preparedness, several meetings were held in January at all levels. The meeting of the Election Commission officials has ended and the announcement will be made shortly. The Press conference is being held at Vigyan Bhawan. As per Zee News sources, Assembly elections in Jammu and Kashmir may not be held simultaneously with the Lok Sabha election. Amid reports that the photos of Indian Air Force Wing Commander Abhinandan Varthaman were being used on the boardings by political parties, the Election Commission on Saturday asked politicians to "desist from displaying photographs of defence personnel". Meanwhile, the Aam Aadmi Party (AAP) launched its mega campaign for Lok Sabha polls in Delhi on Sunday. The party will be contesting the polls with full statehood as its central theme. AAP leaders on Sunday staged a protest near BJP headquarters on the Deen Dayal Upadhyaya Marg, demanding the party to clear its stand on full statehood to Delhi. Soon after the announcement that the EC will declare the poll schedule today, former Jammu and Kashmir chief minister Omar Abdullah tweeted "bring on the dates, let's fight the good fight." The wait ends as done the BJP’s tax payer funded campaign spree. Bring on the dates & let’s fight the good fight. This is the 16th Lok Sabha which will come to an end on June 3. The 2014 election had taken place in nine phases between April 7 and May 12 while the counting of votes took place on May 16.